1. There are 10.8 million illegal immigrants estimated to be currently living in the United States. 2. Between 4 .5 and 6 million of those were admitted legally (temporary work visas or border crossing cards) and are considered illegal because they have violated the condition of their crossing by not returning home. 3. Around 76% of illegal immigrants are Hispanic but only 59% of illegal immigrants are from Mexico. The next closest ethnic group is Asian at 11%. 4. Around 5.4% of the entire labor force of the United States is comprised of illegal immigrants. 5. In 2008, 25% of all farm hands were undocumented workers and 17% of all construction workers were here illegally. 6. Around 11% of people born in Mexico resided in the United States in 2008. 7. The number of illegal immigrants in the United States is greater than the total population of Ohio. 8. 34% of all illegal immigrants are between the ages of 25 -34. 9. The states with the largest illegal immigrant population are California (2.6 Million), Texas (1.6 Million), Florida (720,000), New York (550,000), Illinois (540,000), and Georgia (480,000). 10. The states where illegal immigrants make up the largest percentage of the total labor force are Nevada (12.2%) and California (9.9%). · State and local governments often provide services to illegals and their families (everything from parks and after-school programs to police and fire service) but are unable to recoup these expenses through income tax, property tax, etc. · It raises healthcare costs because most illegals rely on hospital emergency rooms for even routine medical maladies which in turn cause the hospitals to inflate prices for American citizens. · Illegals are willing to perform tasks for lower wages which forces many American citizens out of their jobs and inflates unemployment numbers. · Beef up border security between Mexico and the United States to reduce the number of illegal crossings. · Empower local, state, and federal law-enforcement to verify the immigration status of citizens whether or not they are suspected of committing a crime. If the person’s status is deemed illegal, they are immediately deported. · Abolish legislation that allows children born on American soil to receive immediate citizenship. · Increase fines for employers that knowingly employ illegal workers. · Offer amnesty to all illegals already in the country to compel them to pay taxes. · Combine all of the above. Proponents of this strategy argue that if the border is not secure, we are wasting money by deporting anyone since they can come right back over. One realization of this strategy is the Secure Border Initiative Fence, an ongoing program that seeks to prevent unauthorized entry using state of the art fencing, cameras, thermal imaging, and radar. According to a 2009 report on the project, this hi-tech barrier averages a cost of $2.5 million per mile (although costs vary wildly due to terrain, labor, and land acquisition fees) which allows us to estimate the total cost of securing the 2,000 mile Mexico / U.S. border at roughly $5 billion dollars. However, this does not account for the increased personnel costs for the United States Border Patrol which currently employs over 20,000 and costs the federal government over $10 billion a year to operate. The major flaw of this strategy is that 50% of all illegal immigrants crossed the border legally, so even at its most potent this strategy only affects half the issue. Proponents of this strategy advocate that stricter enforcement of existing laws will remove illegal immigrants and discourage others who seek to enter the country illegally. By sweeping a wide dragnet across the country we can affect all illegal immigrants regardless of whether they originally crossed the border legally. Theoretically this sounds pretty effective, but what would the cost of such an operation be? Julie L. Myers, chief of Immigrations and Customs Enforcement, estimated that the cost to simply deport the all illegals currently residing in the United States would be $94 billion at a minimum. This does not take into account the financial burden that would have to be assumed by state and local governments to add personnel to their already overtaxed law enforcement agencies. While this strategy would certainly be an effective way to reduce the number of illegal immigrants, it would be costly and could result in larger government agencies and less personal freedoms. A. A large percentage of pregnant women cross into the United States illegally so that their child will qualify for welfare benefits, plus it makes it more difficult for the federal government to deport the rest of the family. B. Since illegally crossing the border is a risky, often physically challenging ordeal; most people who cross into the United States are in their prime working and child-bearing years so they would naturally have a higher rate of children. As with most issues, the answer probably lies somewhere in the middle; and while repealing a law is certainly cheaper than the billions we would spend on fences and deportation, the rewards are likely to be minimal since children who are legal citizens are going to be the most likely to grow up and pay taxes. This strategy involves punishing those who knowingly hire illegal immigrants, thereby reducing the number of jobs available to them, which would minimize the temptation to enter the country illegally. As the figures revealed, the majority of illegals work as farmhands or construction workers which means that the largest fines would be assessed to American farmers or construction companies. This could have a negative impact on food prices and construction costs and, like the deportation strategy, puts the burden of enforcement on state and local agencies. The thinking behind this approach is that illegal immigrants are given the chance to come forward and register as United States citizens. This would bring in more tax revenues (around 77%) but would also create a greater drain on public services (around 118%) creating a cost of around $29 billion. Like any other proposed solution, amnesty does not come cheap and is not a full-proof solution. Interestingly enough the deficit created by amnesty is not necessarily because illegals would use more public services; rather it is because under the current income tax system they would owe very little on their meager wages. · According to a study by the University of Michigan and the PEW research group, about 55% of illegal workers currently comply with federal, state, and local tax laws. · Some states fare better than others. For instance, sales-tax heavy states (such as Tennessee) tend to recoup expenditures faster from illegals than states that rely on income and property taxes. · The demographic most likely to find themselves competing for the same jobs as illegal aliens are adult males who did not receive a high school diploma or a G.E.D. · The top three jobs held by illegals are farming (25%), grounds keeping (19%), and construction (17%). 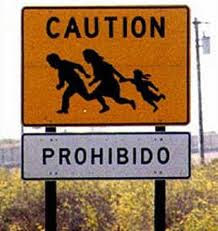 · The average household income for illegal immigrants is $36,000 per year compared to $50,000 per year for non-illegal immigrant households. · This is a complicated picture to get a handle on and is extremely region specific. For example; 15% of people incarcerated in Arizona are illegal immigrants even though illegals make up only 7% of the population. Even more troubling is that of all state prisoners locked up for kidnapping, 40% were illegal immigrants. · The story in other border regions is just the opposite. The FBI reports that the crime rate in border regions has dropped by an average of 10% over the past decade. · San Diego, California saw violent crimes drop 17% over the past decade and even Arizona saw an overall crime rate drop of 10%. · Proximity doesn’t seem to factor in much anyway, as one of the cities with the largest drop in violent crime (37%) was El Paso, Texas, a city that sits 5 miles across the border from Juarez, Mexico which boasts the highest murder rate in the world. It was extremely hard to find reasonable sources for the illegal immigrant issue. I found several sites that insisted that illegal immigrants were costing the country trillions of dollars a year, and others that praised illegal immigrants as a blessing to the economy. By taking the statistics in aggregate, I have come to realize that illegal immigration does cost taxpayers money. How much is debatable (in 2004 the Center for Immigration Studies estimated that illegal aliens cost the Federal government almost $11 billion) but what is equally clear is that any proposed “solutions” will also cost money. Some would respond that the cost is irrelevant because those who cross the border illegally have committed a criminal act and therefore we must enforce the laws, but that it is a difficult position for me to follow considering that 50% of all people currently considered “illegals” crossed into the country with our permission and just didn’t go home when we asked them to. · Reevaluate the circumstances under which we issue temporary visas and work permits. We are obviously unable or unwilling to enforce the parameters of the permits we issue and most are being used as a permanent pass to set up residency. · Further secure the border by adding personnel and upgrading fencing and surveillance technologies. This will cost billions, but it is still a bargain compared to other options. · Offer amnesty to those already here. Our country is drowning in debt, and with an estimated price tag of $94 billion we cannot afford to sweep a dragnet across the country and toss everyone out. Furthermore, the massive invasion of privacy necessary for a large government entity to identify, arrest, and deport 12 million residents is a frightening thought. Interestingly, it appears that the most effective way to reduce illegal immigration is economic downturn. Since the onset of America’s economic recession, the number of illegal aliens residing in the United States has plummeted by 1 million, the single largest drop in three decades. It would seem that the most successful immigration deterrent is widespread financial collapse and scarcity of employment and that is one solution that we do not need to try again. Does Illegal Immigration Lead to More Crime?